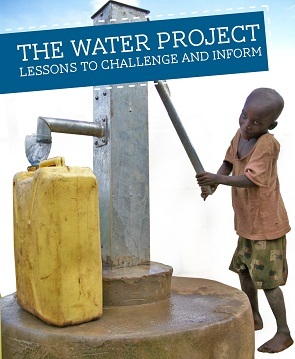 We're excited to introduce our comprehensive Water Crisis Lesson Plans for teachers in elementary through high school. This teacher's guide can be used as a whole or easily as individual lesson plans across a variety of core subjects. You'll find interactive activities, worksheets, research ideas and resource lists for you and your students. Together you'll discover the water crisis and, most importantly, some of the solutions to solve it for people in need. Whether you're teaching on international issues, social studies, earth sciences or writing, we think you'll find this guide a useful tool in helping your students explore the most foundational issue facing the developing world today. We have organized the Teacher's Guide into four easy to use sections. You can preview each lesson below and then download the guide. Students will explore issues including water scarcity, the effects of dirty and unsafe water, and the lack of proper sanitation and hygiene in a community. Using our website as a research tool, they'll be led to a deeper understanding of these issues. We've put the information you need right at your fingertips. "Water Water Anywhere" illustrates the principal of water abundance versus water scarcity, both physical and economic, by having students move through three stations in which they must fill a water bottle using different rules at each station. "Dirty Water... So What?" uses a jigsaw approach to have students teach each other about four potential effects of dirty water: poor health, increased hunger, perpetual poverty, and lack of access to education. "Hand Washing Hang Ups" explores the challenges of teaching hand washing and introduces students to the innovative, low cost solution of the tippy-tap before having them get creative in their own solution making. Students will learn about the different methods available to bring clean, safe water to a developing community. They will wrestle with the challenges of competing ideas and technical solutions. Then they'll work as a team to discover the best way forward in a particular setting. "Village Voices" is a small-group, role-play simulation activity in which students must use their own skills of deduction, along with The Water Project website to determine which type of water technology is best for four distinct villages. "Water Projects Word Search" harness the information found in the Types of Projects section of The Water Project website as students use clues to determine what vocabulary words they must find in the puzzle. "Just the Facts: The Water Crisis by the Numbers" is a list of some of the most commonly used, compelling and interesting facts about the world water crisis. Citations are included. "Keep on Digging" is an annotated bibliography highlighting many of the top sources and agencies from across the water and sanitation sector. It is an excellent resource for additional research. We have found that when teachers introduce these problems and solutions, students are often quite self-motivated to get directly involved in real-world activities to help. The tools provided will spur their creativity and provide tools to take action.